According to an investigation led by the Universidad Complutense de Madrid (UCM), the oldest studied rodent fauna that inhabited the Iberian Peninsula 12 million years ago progressively shifted north toward humid environments to survive climate change that caused prominent dry and cold environments in central Iberia. The results of this study, published this week in Scientific Reports reveal the effects of climate change on past biodiversity based on the analysis of changes in fauna with different ecological features (dietary habits, habitat preferences, etc.). The study focuses on the rodent faunas that inhabited the Iberian Peninsula between 12 and 5 million years ago. This timeframe is particularly relevant for the evolution of past climate, as it is a period of intense cooling coupled with increased aridity at a global scale. This global trend radically transformed landscapes in Southwestern Europe, which became increasingly more arid. "We compiled information from all the rodent species present at more than 100 fossil sites in the Iberian Peninsula and the South of France, which allow us to statistically evaluate how these rodent communities were grouped based on their ecological affinities. Then, we tested how these associations were affected by the critical environmental changes happening in the region between 12 and 5 million years ago," explains Fernando Blanco, researcher at the Department of Geodynamics, Stratigraphy and Palaeontology (UCM). This work confirms the strong influence two important environmental events on mammal communities: the Vallesian crisis 10 million years ago, and the Messinian crisis 6 million years ago, during which nearly the whole Mediterranean basin was completely drained. During the studied time interval, the climatic changes provoked diversity and distribution changes on rodent communities. "One of the main outcomes of this study is that older faunas linked to environments that were disappearing due to increased aridity were displaced to the north, surviving temporally in local refugia with more humid conditions, particularly in the region of Catalonia and the South of France," says Manuel Hernández Fernández, professor at Universidad Complutense de Madrid and senior author of the study. Rodents are an ideal group to conduct palaeoecological research: (1) they are among the most diverse groups of mammals, (2) they are widely distributed geographically across a huge range of ecosystems, and (3) they are particularly sensitive to environmental changes. Furthermore, their fossil record is extraordinarily rich. "In the Iberian Peninsula, the number of fossil localities with rich assemblages of rodents are counted by the hundreds," says Fernando Blanco. "This study moves the field toward more comprehensive studies spanning larger geographical regions and longer timeframes to understand in higher detail the effects of past climate change in extinct faunas," says Ana Rosa Gómez Cano from Institut Català de Paleontologia and coauthor of the article. This study is the result of more than 50 years of digging and research experience in Iberian Peninsula and southern France fossil sites. These kinds of studies are essential to create explanatory, or even predictive, models to anticipate the effects that climate change might have on current biodiversity. "By understanding in depth the effects of past climatic conditions on extinct biodiversity, we might be able to anticipate these trends in the future. 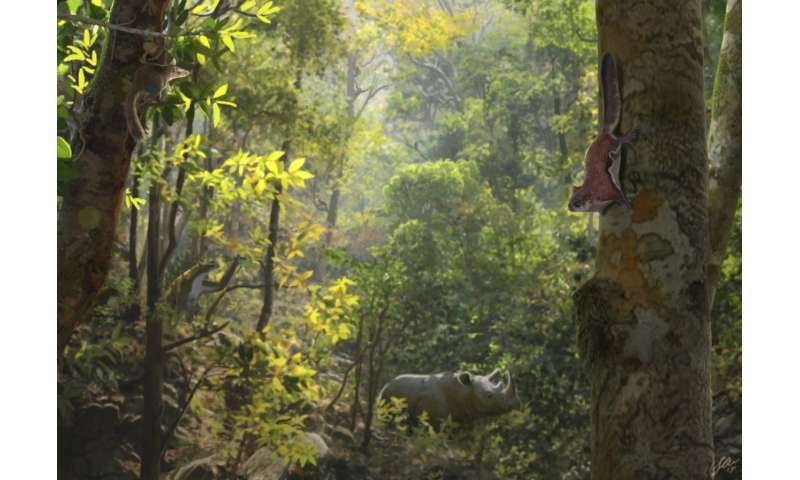 In this sense, I believe palaeontology has a crucial role in the study of modern global change," says Fernando Blanco.